VT Explorer provides access to real-time AIS position data, technical information and photos of over 150,000 vessels every day. 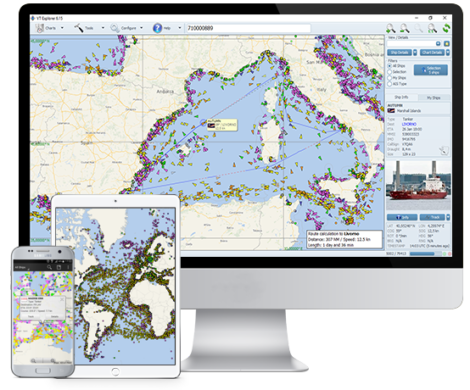 VT Explorer allows you to monitor the global picture of marine traffic from your PC or mobile. It is a powerful tool for fleet tracking, monitoring ship schedules and port arrivals for the coming weeks or analysing the ship trading patterns. Combining data from a large network of Terrestrial AIS receivers and Satellite AIS technology, VT Explorer is one of the leading vessel tracking service providers all over the world, adding a great value to people in the maritime industry, insurance, and trading sector.